The UC Riverside team studied miRNA expression in the Aedes aegypti fat body—the metabolic center that plays a key role in reproduction. Since proper functioning of the fat body is essential for the development of the female reproductive system after a blood meal, identifying which miRNAs are important to fat-body functions, and what specific genes they target, can help design ways to manipulate the levels of miRNA or their targets, affect their interactions, disrupt mosquito reproduction, and thus prevent the spread of diseases the mosquitoes transmit. 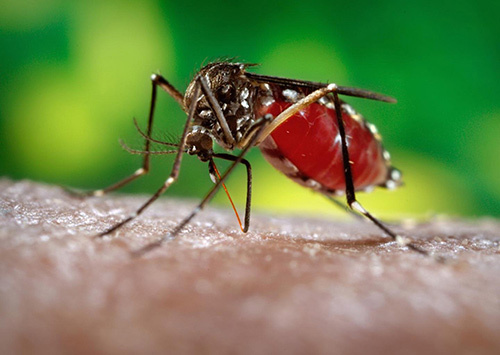 Interestingly, the investigators observed five major miRNA expression peaks within a 48-hour period following the female mosquito's blood meal. Dr. Karginov and his colleagues measured the levels of all miRNAs in the fat body (roughly 100 different miRNAs) at five points of time, starting just before mosquitos take a blood meal, and then 6, 24, 36, and 48 hours after the blood meal. The timing of these was chosen based on previously known information on the timing of major physiological changes—or milestones—in the fat body after a blood meal. Interestingly the researchers found that each miRNA, together with a partner protein called Argonaute or “Ago,” binds to (or “targets”) several messenger RNA (mRNA) molecules, and thus down-regulates the expression of the corresponding genes. Determining the targets of important miRNAs is crucial to uncovering the regulatory gene networks that drive the physiological changes in the fat body after a blood meal. Additionally, the researchers identified the binding sites for Ago/miRNAs on mRNAs within the fat body. They performed this identification at two points of time, to study any changes that may have occurred, using a high-throughput RNA sequencing technique called “CLIP-Seq,” that provides a large trove of potential miRNA-mRNA interactions for further investigation.